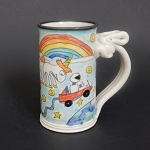 "Creative Genius" - art mug - ONE OF A KIND. Abe Lincoln heard the wisdom of the unicorn wind! - art bowl - ONE OF A KIND!